What’s the best way to find an answer? Ask the question. I like many other new indie writers asked myself day in and day out “Whats what can I do to be a success” But I was asking the wrong person. So I set out on the internet and found “guru’s” when I should have been finding successful writers and asking them what they did to be successful. So that’s what I did. 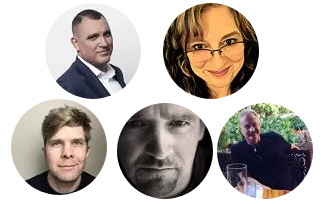 I found 5 successful writers on Amazon Kindle and I reached out to ask them what the number one thing a new author could do to ensure long-term success was. As a horror writer, I didn’t want to pigeonhole my success research. So I asked authors from a variety of genres. Here’s what they had to say. You can find more information about Vaughn here and find his books here. Find more advice from Michaelbrent here and his books here. More information about Michaelbrent visit his website here. You can find Jennifer’s books here, and more information about her at her website here. You can find Derek’s books here and his website here. Derek also operates The CreativIndie website where he talks about publishing indie books on kindle and kindle unlimited. “For me, as a first-time author who started writing as a late night hobby purely for my own enjoyment, I didn’t expect to sell more than a few hundred to friends and family so success for me was simply posting my novel on Amazon and holding a copy of the paperback in my hand. Once Bishop’s War sales skyrocketed on their own I definitely re-calibrated my expectations, but only 18 months after self-publishing one novel the notion of long-term success in the industry is still an elusive target for me. I hope that when I release my sequel, Bishop’s Law, in the fall it will achieve the same level of commercial success (or even surpass it), but that is still to be determined. One piece of advice I will pass on is to write with passion and for your own enjoyment and not for commercial success. It’s great for any author to have readers rave about your work, but do not allow yourself to feel in anyway unsuccessful if your novel(s) don’t immediately find an audience. It may sound cliché, but believe in yourself and keep creating. You can find Rafeal’s book here and more information about him on his blog here. Thanks for reading. If you found this helpful maybe others will too! Share your thoughts in the comments. Next How Much Do You Write Each Day? Fantastic post! Well done you for asking the questions! Some great insight, thanks for posting! Great advice from the people that make it work. Thanks for posting!